Mudshark is the smartest kid in school, finding lost objects and solving mysteries for his classmates and teachers. 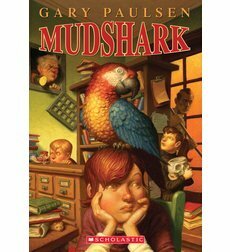 When a psychic parrot takes up residence in the school library, Mudshark’s detective agency is threatened, and he’ll do anything to outsmart that talking bird. Between stolen chalkboard erasers, a missing gerbil, and a toxic situation in the faculty restrooms, Mudshark will have to think and scheme and plan to save his school! This story is hilarious, with weird and wacky characters, and a silly plot. Mudshark himself reminds me a little bit of Encyclopedia Brown, with a photographic memory and an eye for details. He’s a puzzle solver, and has lightning-quick reflexes. My only complaint is that the plot isn’t very cohesive. Some of the tangents don’t tie back into the main plotline, and a few of the scenes are only there to establish characters that don’t have any influence on the main storyline. I wish the story had a more stream-lined plot, and didn’t add so many unrelated details. It’s still very enjoyable though!